When divorcing North Dakota couples can agree on the terms of their property division and the value of all assets, they must jointly submit a property and debt listing. This document helps the court confirm that the proposed settlement arrangement is fair and equitable. This Form 5A is available on the website of the North Dakota Supreme Court. North Dakota Property And Debt Listing 5A Step 1: At the top of the page, enter the North Dakota county where your divorce is being processed. North Dakota Property And Debt Listing 5A Step 2: Enter the name of the plaintiff and defendant as previously assigned. Enter the civil number of your case. 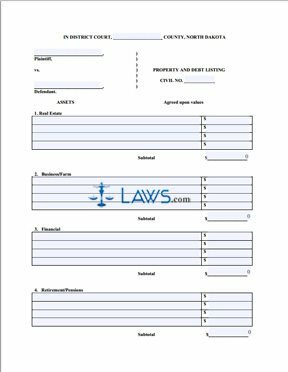 North Dakota Property And Debt Listing 5A Step 3: The first section requires you list real estate assets such as houses and apartments, along with their fair market value as agreed to by both parties. North Dakota Property And Debt Listing 5A Step 4: The second section requires the same information about all businesses and farms owned by either or both spouses. North Dakota Property And Debt Listing 5A Step 5: The third section concerns financial assets such as stocks and bonds. North Dakota Property And Debt Listing 5A Step 6: The fourth section concerns retirement and pension funds. North Dakota Property And Debt Listing 5A Step 7: The fifth section concerns all motor vehicles and watercraft. North Dakota Property And Debt Listing 5A Step 8: The sixth section concerns household goods and personal property. North Dakota Property And Debt Listing 5A Step 9: The seventh section requires you to list all current debts owed. North Dakota Property And Debt Listing 5A Step 10: In the eighth section, provide the total for every type of asset as determined. Add these to arrive at a subtotal asset value. North Dakota Property And Debt Listing 5A Step 11: Both spouses must sign and date the form in the presence of a notary public.